I’m reliably informed by scientisty types, and friends and relations who are doctors and therefore were medical students, that my cranium contains lots of neurons and nerve synapses and the soft squishy type stuff that makes me say “eurgh” if I think about it too much. But what if it’s all a con? What if several comic artists and the Dr Who writers were right? What if, my head is actually filled with little tiny Caries that move levers and turn wheels to send me about my daily business. Well, I can tell you one thing. If that’s the case, they’re decorating the place out with little tiny beach huts. When I say that my blood runs salty, I usually mean that my pulse quickens to the sound of crashing waves, that I take a deeply satisfying pleasure in stretching for the horizon and not reaching it, that I have a special reserve of memory for the way to tiny hidden coves and the cliff path to the best surfing beaches. 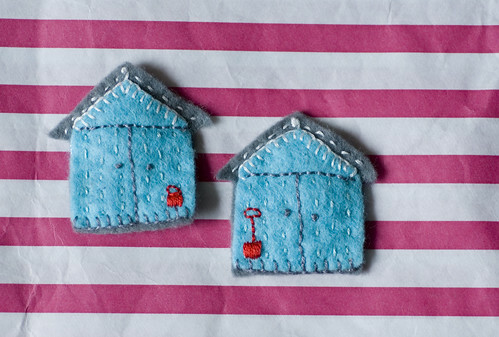 But since our trip to the South Coast I seem to be dreaming in beach huts. Clearly the existence of little people is the only reasonable explanation, so I did what any other ordinary rational and (most importantly) completely sane person would do. 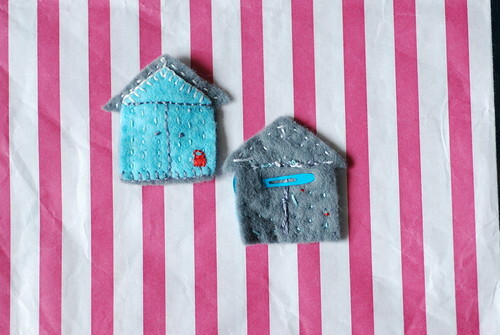 These teeny tiny little huts are actually hairslides for our little beach-loving daughter. Well, I say teeny tiny. On me, they’re teeny tiny. The model was asleep when I made them, and asleep when I took these photos so you’ll have to trust me when I say that they’re not quite big enough to qualify as a hat for Ascot, but they’re sizable, about an inch across and a little more vertically. 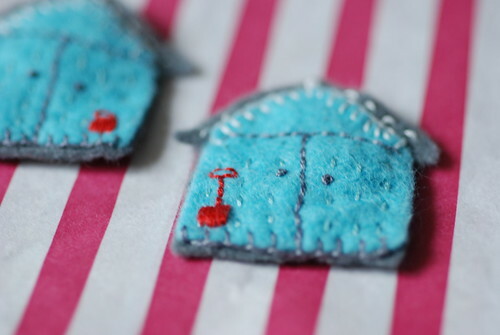 The clip itself is held between the turquoise and the grey layers with the clip prong poking through a hole in the back of the grey layer, one for each side of her head, and I used the embroidery to hold it all together and make it look nice and beach hut-y. The main connecting points are the backstitch to make the doors and the blanket stitch on the gable and the base, and the rest is just running stitch and a few french knots. And my favourite part? The teeny tiny bucket (yes it is a bucket) and space. The mini Caries are very happy. Those little buckets and spades are soooooo cute!